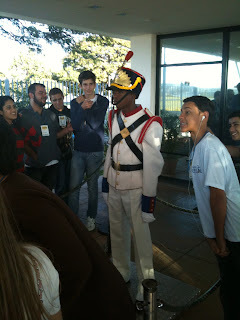 This is the last of my posts on Brasilia, Brazil. My first was an overview of mindbogglingly fascinating planned city and would be worth reading before or in conjunction with today's post. The others are listed in yesterday's post. Many people I spoke to stated that Brasilia was built for the car not the pedestrian. This is not strictly true. The designer's intention was that people and cars would be separated giving people safe spaces to walk in and cars few restrictions eg few pedestrian crossings. The idea is that between the city's sectors, people would drive (or be driven). Once in a sector, they would walk along distinct walking routes. The Realties are very different. Brasilia has very high car ownership and usage. In a country with low car ownership and usage comparatively. The lessons from this? Our cities need to reflect that humans need and want to walk and allow them direct safe routes. Probably too late for Brasilia but not too late for other places. Lessons below. Walking between sectors is almost impossible. I think this first video fascinatingly illustrates this. The Hotel Diplomat and the Econohotel are about 600 metres apart. One is located in the Northern Hotel Sector and one in the Southern Hotel Sector. To safely and legally walk between them requires a 2.3 kilometre walk. The Walking routes that have been laid out for people in Brasilia are not the shortest. This video shows an example of this outside a shopping mall. To cross the road to the mall legally means a diversion of at least 400 metres in total. 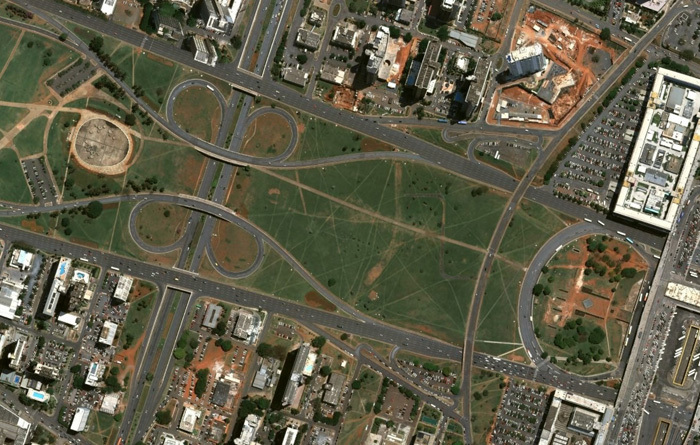 This aerial shot of Brasilia from the Blog Discovering Urbanism shows the massive network of unofficial paths that criss cross the open space so people can get to places faster. It was uncanny at times to walk around this city and not see another pedestrian. There are very few cities in the world that have no one in the downtown walking. These three shots show some interesting contrasts. The first shot is of the street. The second is of an aerial walkway connecting two shopping areas over the Bus station. The third is the shopping centre interior. Where are the people? The shopping centre can be accessed by car, subway and bus but not by foot. I tried it and its not easy. I have already mentioned in a previous blog that many of the the walking routes are not clearly identified. They need directional signposting, maps and other clues that you are heading in the right direction. A few legal crossings mostly accompanied by a very unpleasant audible walk signal as demonstrated in the first video below. June 17- Appraising Brasília -How does this planned city rate? Tomorrow's Blog will tackle the fundamental problem of Brasília- successfully being a pedestrian! 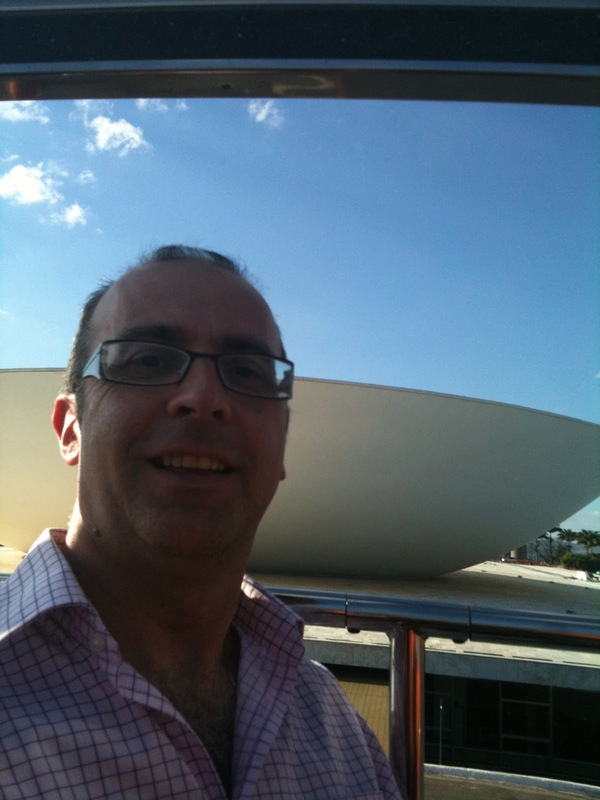 I took a very informative Tourist bus for a two hour tour of Oscar Niemeyer's awe inspring architecture. Niemeyer's was responsible for most of the public buildings in Brasília. You would recognise his UN Headquarters in New York City. He is still designing buildings at the age of 103! In Brasília, his buildings are mostly arranged along the the East West axis of the city known as the Monumental Axis (see blog post). First building on the Monumental Axis moving away from the centre of Brasília is the space agey looking National Museum. Great building and looks fascinating. My criticism is that it looks very alone in the huge square that surrounds it. 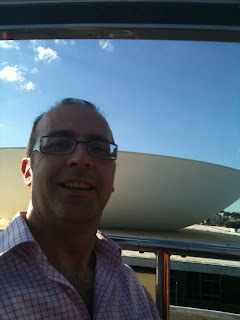 In my first blog about Brasília, I dare to suggest the museum needs another building plus I would love to see a Guggenheim built opposite it. The exhibits in the Museum are very good but modest. The museum can be thoroughly visited in a less than an hour. 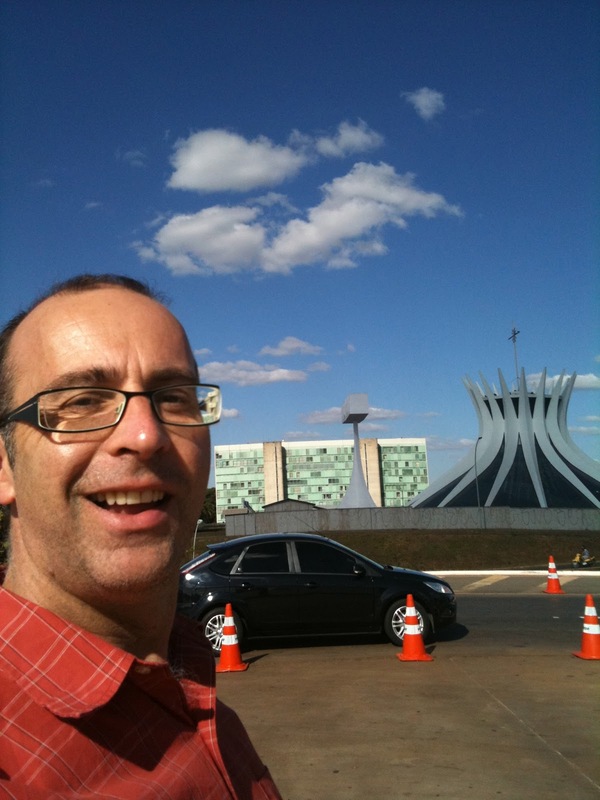 I fell in love with the Brasilia Cathedral which is next along the axis. Its amazing! Consisting of sixteen curved 90-ton concrete pillars and stained glass panels, it is a stunning modernist building opened in 1970, ten years after the city's opening. Niemeyer was deservedly awarded the Pritzker Architecture Prize, considered the most prestigious architecture award for the Cathedral in1988. His intention for the cathedral was for it not be gloomy and he succeeded. The light filled building soars to heaven. I was surprised at how clearly under utilised the cathedral is for the main church in the capital city of a predominantly Catholic country. There are very few pews in it, for example. The day I was there, they were preparing for a wedding. There were decorated pews and a mirrored walkway reflecting the sky. Brazil's National Congress Building almost at the end of the Monumental Axis looks very similar to the UN Building in New York City. The semi-sphere on the left is the seat of the Senate. Currently, the Senate comprises 81 seats with three Senators from each of Brazil's 26 states and the Federal District. Senators serve eight-year terms. The semi-sphere on the right is the seat of the Chamber of the Deputies. There are 513 deputies representing their disticrts. Between them are two vertical office towers for the Congress. In front of the complex there is a large lawn -used predominantly for demonstrations and a reflecting pool. Behind the congress is the Praça dos Três Poderes (Three Powers Square). Three Powers Square is where the Monumental Axis finishes. This is Ground Zero for Brasilia. The buildings representing and housing the three powers that "rule" Brazil were the reason why the entire city was planned and built.. The other two Powers are represented by the President's Palace (Palácio do Planalto) and the Supremo Tribunal Federal. I didn't like the Square. It felt too sterile, too barren and too large. To me, it makes the three buildings which are all great buildings feel distant and forbidding. I also would have thought having these buildings closer down toward the lake would have been a more pleasant backdrop. This would have meant orienting the city further east. There were many people there on the day I visited but the square felt empty. One building in Brasilia that is near the lake is the President's Residence: Place of the Dawn which is built on a Peninsula jutting into this artificial lake. What made the President's Palace fun this visit were the school kids trying to make the Presidential Guardsman react. 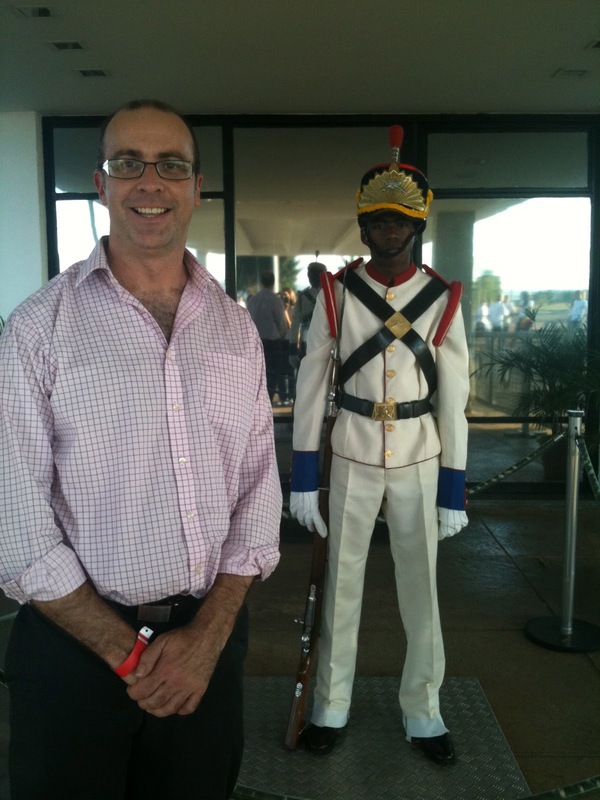 Like their London counterparts, the guardsmen who protect the President stand unsmiling and almost unblinking. The Palace was finished in 1958 before the City was opened. It has since been thoroughly renovated. The Palace of Justice is made more attractive with the addition of flowing waterfalls along the front. It stands opposite the Foreign Affairs Ministry which has a lovely reflective pool out the front. We went past the National Library which again looks good but looks lost in a barren concrete landscape and the Cultural Centre which looked lifeless. In a nation with such an exuberant culture, it could have looked much more alive. Niemeyer also designed the first building at the University of Brasília and the first hotel both of which I didn't have time to see. His latest project (at the age of 103) is Digital Television Tower which should be opened sometime this year. It looks amazing! 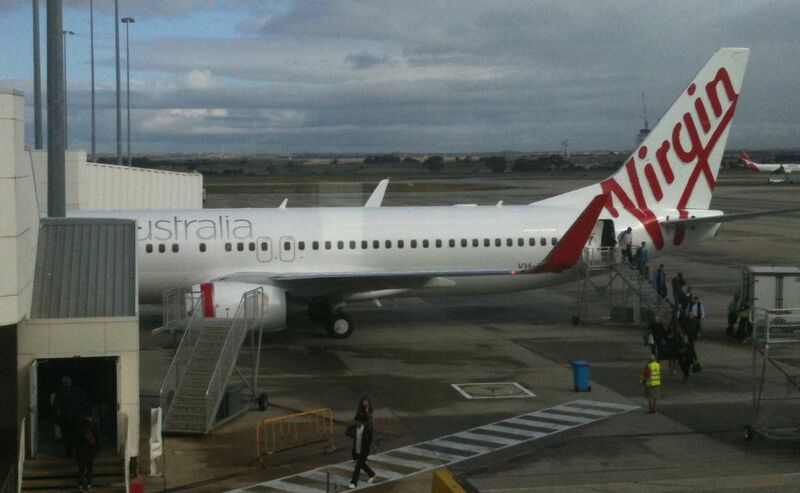 The plane had landed in Australia four days before, the day that Virgin Blue became Virgin Australia. I was seated up front in Seat 1A which is one of Virgin Australia's brand new business class seats (Virgin Blue started as a one class airline). There are eight such seats on the plane -two on each side. A very stylish plexiglass screen separates Business class from the Main cabin. It looks similar to the Virgin America layout which I love*. 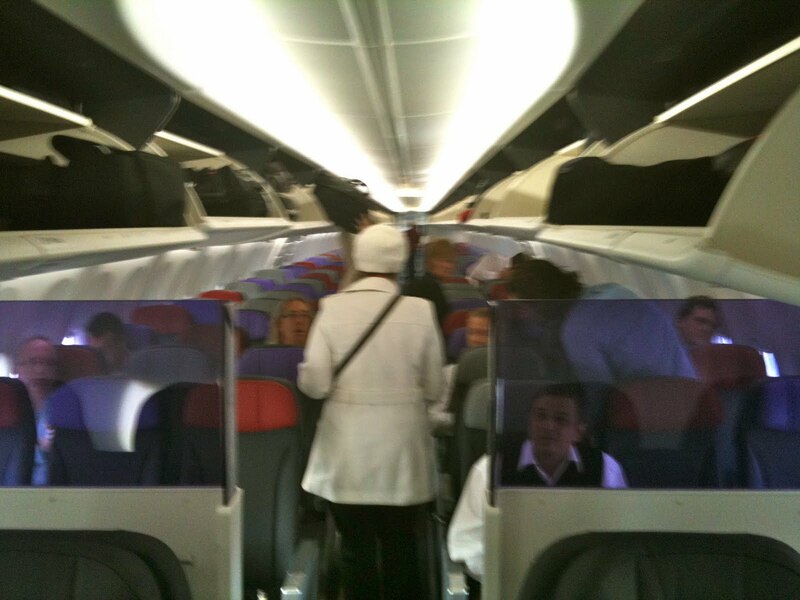 In Main cabin: are 168 Virgin Australia "next generation economy seats". These seats are made by aircraft interior company B/E Aerospace. The lighting is really well done and makes the plane feel bigger. The flight was very comfortable - I slept for most of it (even thought it was short). Meals, drinks and water are complimentary upfront on Virgin and the new menus are good. You still pay in economy for meals (unlike Qantas which still gives free domestic and international meals. Some Velocity Gold members have reported being given "freebies" in Economy. Anyone able to confirm or deny this? It was a very fun flight with a group of very excited cabin staff flying their first flight on this new plane. I am not a huge fan of the 737 but this one feels amazing. As two of the staff said "we feel like a proper airline now"
Ironic that Qantas continues to go down market as Virgin goes up. One wonders if they should have swapped CEOs? Thats another story. One final question: Why did Virgin Blue/Pacific Blue choose "Virgin Australia" as their new name and not "Virgin Pacific"? Virgin Pacific would complement Virgin Atlantic and it makes more sense to have a flights operating between Tonga, Fiji and New Zealand with "Pacific" on the tail and not just "Australia". Any comments on this? I am attempting to not fly for a month! I travel with a whole stack of electrical cords, plugs and outlets. I have stored them all together in a little box. They got all tangled up and the box is thicker than I want for my hand luggage. I then stored them in 3 little bags which fit into my small pockets of my laptop bag- I then forget what is in which bag! How do you store your cords, plugs and adaptors? I need something which protects, is light, 2.5cm thick (can be 60cm wide), not too expensive, is easy to access stuff from my laptop bag whilst at an airport or on a plane. What do you use? 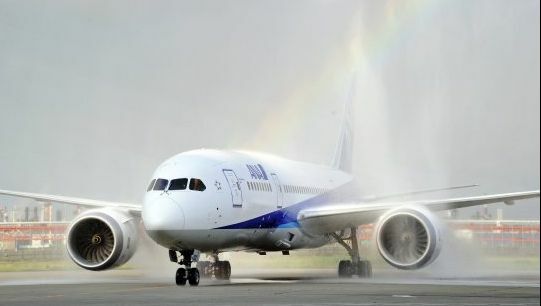 Great review from the Sydney Morning Herald about the 787 - what do you think? Air India to start 787 service to Melbourne in October! NO! Media Reports are full of the news that: "Melbourne will be the first Australian city to receive scheduled 787 service when Air India deploys the aircraft on its new Delhi-Melbourne route in October." (Flightglobal.com). Seeing that's my home city, I took an interest. Context first: This news came amidst celebrations accompanying the touchdown of a 787 at Indira Gandhi International airport in New Delhi. Air India has 27 of the planes on order and got $45million in compensation for their delayed delivery (three years now). Air India is the number two customer for the 787 after Japan's ANA. In an article in the Calcutta Telegraph an unnamed Air India official said "Direct flights to Australia are the top priority for us. The route will be profitable for Air India and is a key ingredient of the turnaround plan,"
The chance of an Air India Boeing 787 flying from Melbourne to Delhi in October is as likely as a flying elephant or magic carpet doing the same route that month! 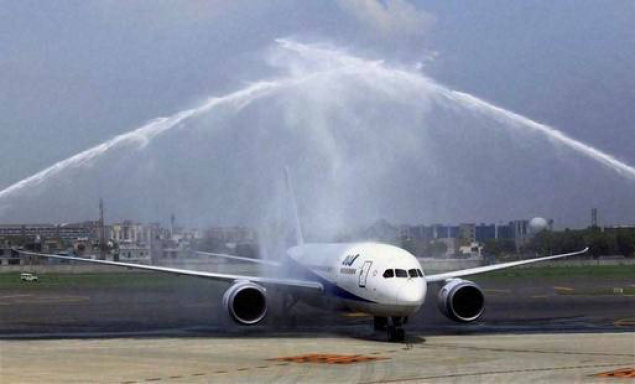 Or as we say in Australia: "pigs might fly"
Welcome for 787 New Delhi's IGI airport last Wednesday. 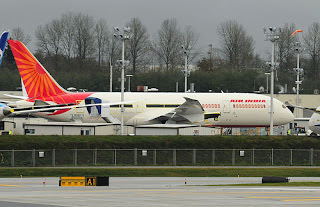 Boeing is giving no one- ANA, Air India, the press, any definite delivery timetables for the 787s. They have been saying September, 2011 since June. September is six weeks away. 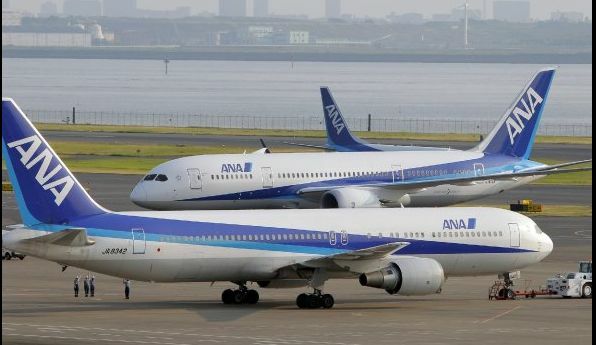 There are reportedly ten in Seattle waiting for delivery to ANA first, followed by Air India. to start a MEL-DEl service will require familiarisation and approval from Indian and Australian air safety authorities. Air India is b.r.o.k.e. They have got a lifeline from the government and are seeking more. Do they really have the economic resources to fund a loss making flight? They will want to market this flight heavily to fill planes from the start. That needs a lead time longer than six weeks. If I am wrong on this, join me at Melbourne airport between October 1 and 31. 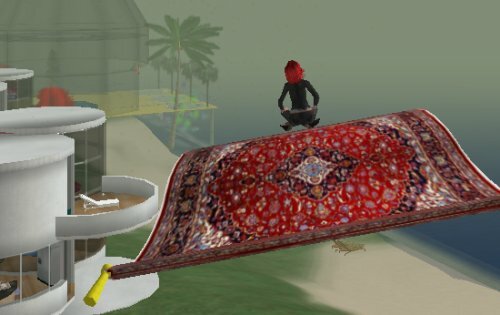 I will be the guy with a magic carpet, a flying elephant and an Air India 787 ticket. This month, my Blog turns one! Although to be fair no one looked at my Blog in the first month! Since then, almost 12 500 people have peeked at a post. In June, 2011, I had the highest number of visitors. In May, I had my second highest number of visitors to this Blog. A lot of readers share my passion for the A380 with almost one in ten enjoying Three Airlines-one plane- comparing the A380. People seem to enjoy my reviews about plan flightses. eg my Reviews of V Australia Australia to LA and Royal Jordanian (Bangkok to Amman) and my scathing report about United to the USA are all big hits. Also enjoyed was my rants about taxis and how to improve them. One third of my readers are from the USA, 30% from Australia, 8% from the UK, 4% are French, 4% Canadian and 3% Indian. 1% are Kiwi, Singaporean and Malaysian. Thank you for travelling with me! Unexpected and appreciated. Thank you. I am excited! The 787 has started a series of simulation flights around japan to test the airliner in service. Here are some great pics from Seattle's Post Inquirer newspaper. I want to fly on it soon! The 7th airline in the world to get their 380 will be China Southern. One of their planes rolled out of the paint shop this week. It will go back into the hangers for more work, apparently, before delivery later in the year. First Class, 1-2-1 layout, is located on the lower deck. 428 Economy seats configured as 3-4-3 on the main lower deck with ten rows on the upper deck at the rear arranged 2-4-2. This is similar to Singapore Airlines A380 arrangement. 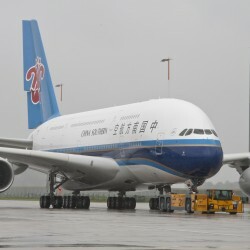 China Southern is expected to start the plane on the Beijing – Paris run. 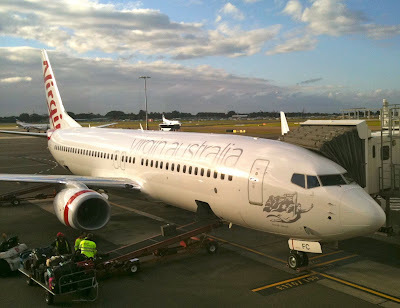 I have been critical about the "budget" carrier Tiger Airways Australia which can be likened to a bus with wings as noted in my previous blog about them. Seems the bus is not safe. On Saturday July 2, 2011 Australia's Civil Aviation Safety Authority (CASA) grounded Tiger after the airline's planes twice breached lowest safe altitudes. This grounding came after they had given the carrier a warning in March saying Tiger needed to "improve the proficiency of Tiger Airways Australia’s pilots, improvements to pilot training and checking processes, changes to fatigue management, improvements to maintenance control and ongoing airworthiness systems and ensuring appropriately qualified people fill management and operational positions." 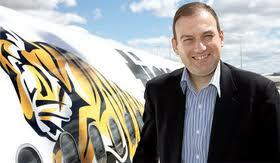 The grounding is a disaster for the airline which has not made money since setting up shop in Australia. The last grounding we had was of Ansett's 767 fleet and that was one of then final straws for them. Unlike Ansett, I won't mourn Tiger but yet again we are going back to the two airline situation we have always had in Australia. The names have changed but the structure is similar. Qantas and Virgin instead of Qantas and Ansett or before that Trans Australia Airlines (TAA) and Ansett-ANA or before that Ansett and Australia National Airways. The difference is Qantas now has two segments of the market with its budget Jetstar subsidiary and the more corporate focussed mainline Qantas. 2. 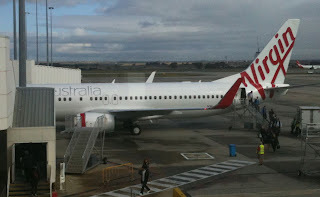 Virgin Australia continues to lose money-how long will they sustain that for? 3, Will Qantas hang onto its premium passengers or lose some to Virgin concerned at the Jetsar -isation of the mainline carrier? As for me, I am taking the train to Adelaide next week. Korean have ordered ten A380s. Five will be delivered this year and the next five not until 2014. They have configured the plane to have the least number of seats of all the airlines flying it (414) with the top deck being all business class with 94 seats. The lower deck has 12 First Class and 308 economy seats. Seoul- Los Angeles (October) which is when I plan to fly with them! I first came to Auckland as an adult in November, 1991 - almost 20 years ago. It was the middle of the 1990s recession and Auckland felt grim. Wellington, Auckland's rival city 640 km (398 miles) was also grim but I connected to Wellington with its art and fashion scene, good public transport and walkable sights. Auckland and I never connected. Despite coming to Auckland over 30 times, Wellington continues to dazzle. I have to concede, however, that Auckland is starting to sway me. With the bulk of Asian immigration impacting Auckland, the range of Asian food and groceries is outstanding. Auckland coffeeshops are taking on their sister city and the arts/theatre scene is becoming more captivating. There is even some fashion scene emerging! Of course Auckland Harbour joins Wellington and Sydney as world leading. Give me a choice of where I would live, I would still choose Wellington but I will give Auckland a little more time and attention. World cup fans will be impressed in September (although why the city could not finish a rail line to the airport is beyond me).